Sunbeam Products is recalling about 5,700 Convertible Clothes Irons sold exclusively at Bed, Bath & Beyond stores nationwide after 20 reports of the irons overheating or catching fire. 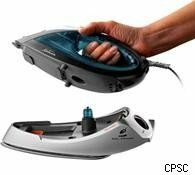 So far no injuries are reported from using the irons, said the U.S. Consumer Product Safety Commission. A wiring issue causes the irons to overheat and consumers could get burned. The irons, which convert to a garment steamer, were sold at Bed, Bath & Beyond stores nationwide from June 2010 to November 2010 for about $60 each.Made in China, the recalled blue-and-gray Sunbeam Convertible Iron has model number GCSBRS-103, which can be found on the bottom of the iron's plastic base. The irons also have date codes of either C235 or C237 imprinted on the plug and on its packaging. Consumers should stop using the iron and contact Sunbeam for a replacement by calling (800) 656-9708. Other electrical gadgets that recently have been recalled because of electrical issues include some GE and Professional Series brand dehumidifiers.